Our range of products include sterling silver whistle, sterling silver toast rack and sterling silver wine chiller. Our organization has successfully expanded its business in the market owing to the offered elevated quality array of Sterling Silver Whistle which is manufactured by using superior quality silver and high end technology as per industry set norms. 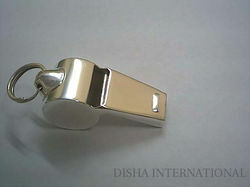 This whistle is extensively used in varied types of sports activities. Moreover, offered whistle is checked under the vigilance of quality experts in order to ensure its quality. We provide this whistle in various sizes and designs, and also at pocket friendly rates. We are offering customized products. 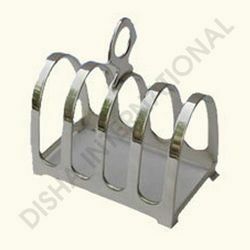 With a precise understanding of the relevant industry, we introduce ourselves as the leading manufacturer, exporter and supplier of Sterling Silver Toast Rack. The offered toast rack is manufactured in sterling silver by our skilled artisans. In addition to this, clients can avail these racks from us at the most affordable rates. We are offering customized products. 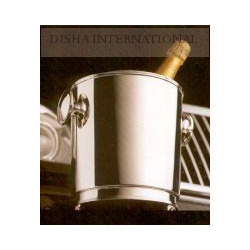 Being the leading names in the industry, we offer our clients wide range of aesthetically designed range of Sterling Silver Wine Chiller that are acclaimed among the clients for elegant designs and smooth surface. Our entire product range is non-toxic in nature and are used to safely keep the ices and used in bars and different commercial places. Moreover, we offer them at most affordable rates with customized solutions. We are offering customized products.